Words are themselves interactions. Visuals are equally important to the copy, since the experience suffers if the words and appearance do not complement one another. Finally, space creates the context for interactions with the right look, feel, and relationship between all elements. 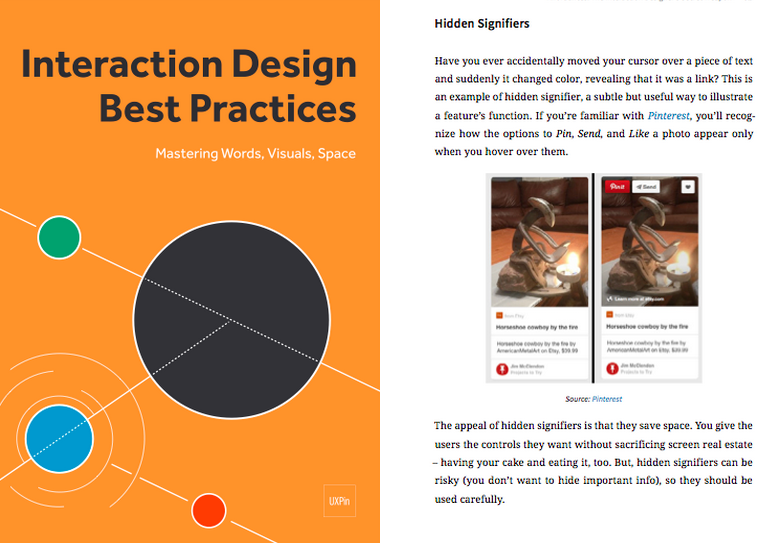 Interaction Design Best Practices: Words, Visuals, Space includes visual case studies, expert advice, and real-life interaction design examples from some of today’s top companies. You’ll learn how to design for the human brain, how to match perception to reality, how to treat white space as a design tool, and much more. While interaction design can be highly theoretical, this book is written with action in mind. Every chapter includes tips based on real-life experiences. Best practices from 30+ companies including Apple, AirBnB, Google, Facebook, Etsy, Virgin America, Dribbble, Hootsuite, and Behance. Practical explanations of how to apply white space, size/distance, microcopy, visual design, and many other IxD disciplines. Advice from experts like Dan Saffer, Jared Spool, Stephen P. Anderson, Rachel Nabors, and others. Plenty of visual examples to illustrate every piece of advice. To learn how prototyping can help perfect interaction design, check out the companion ebook The Ultimate Guide to Prototyping. Check out the free ebooks, and feel free to share if you find them helpful (the 2nd book is unlocked when enough shares are reached).